Main athletic stadium in Katowice predates the college it belongs to by nearly half a century. Sport was practiced here since 1925, while AWF opened in 1970. Currently the stadium has one landfill stand along its northern side, accommodating 1,200 seated viewers. It was entirely renovated in 2008 by municipal and regional authorities (for roughly $1m). 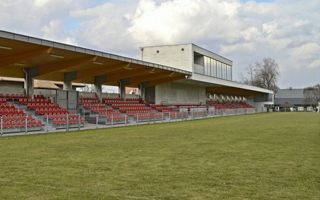 Due to its proximity to the E40 (Europe’s major highway – just 30 meters south of the stadium), it was subject to controversy, feared to be sold for private investment. Nowy Tomyśl is a rare case in Polish football, where neither club manages to keep a spot in the 4th league or event 5th, but their stadium still has floodlights. The 8 masts don’t provide sufficient light for modern TV broadcasting, but are enough to play games or train in the evenings. The stadium has one grandstand based on sloped land, reaching only 5 rows at peak. Still, for years the declared capacity was 3,000 (3,147 the most accurate estimate we found). That changed after conversion to all-seater, when adding temporary tubular northern stand was needed to get close to 1,000.